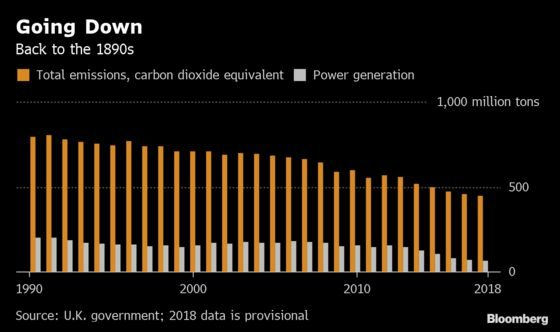 (Bloomberg) -- The U.K.’s carbon-dioxide emissions fell to levels not seen since the reign of Queen Victoria thanks to a shift away from coal-fired power generation to gas, wind and solar. The dirtiest fossil fuel provided just 5 percent of the country’s electricity last year, a record low that keeps the U.K. on track to quit coal for power by 2025, with more than half coming from nuclear and renewables. Lower pollution from utilities and transport was partly offset by increases from homes and the public sector and come against a backdrop of global gains. Britain has slashed emissions by 44 percent since 1990 to the lowest levels since the 1890s, the Department for Business, Energy and Industrial Strategy data show. Homes now produce as much greenhouse gas as power stations, BEIS said. Transport remains the single biggest source of pollution outside of energy in a country that has committed to phasing out traditional combustion engines by 2040. While transport emissions dropped by 3 percent in 2018, the entire sector has only cut that amount in almost three decades. 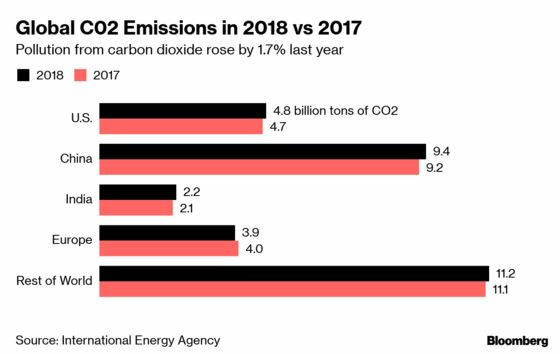 In total, U.K. emissions fell 3 percent, the equivalent of taking about 5 million cars off the road. Power station carbon-dioxide output reductions dropped 10 percent after the nation spent billions of pounds on offshore wind farms. Global carbon emissions from fossil-fuel use increased to a record level last year, after energy demand grew at its fastest pace in a decade, reflecting higher oil consumption in the U.S. and more coal burning in China and India, according to the International Energy Agency in Paris. Britain is cutting emissions having first deployed the polluting model adopted by most countries. During Victoria’s reign from 1837 to 1901, Britain became the most powerful trading nation in the world, based on coal. The country grew into a powerhouse in coal mining, minerals and other raw materials and in the production of iron, textiles and manufactured goods. The carbon cuts haven’t come cheap. “More than half of our electricity comes from low carbon sources thanks to more than 52 billion pounds ($68 billion) of government support for renewable projects in the U.K. since 2010,” part of the nation’s industrial strategy, said Claire Perry, minister for energy and clean growth. Coal’s portion of the power generation mix is down from 40 percent just six years ago. This puts the U.K. on course to meet its target of phasing out coal completely, the government said.